Is this the year that viral marketing jumps the shark? Viral hits are organic, they just happen, rising out of no where to take the Internet by storm. What is painfully clear this year is either how hard it is to do viral marketing or how bad the studios are at it. This season's spate of "viral advertising" has had the exact opposite effect on me then it was intended to have. Take Indiana Jones and the Dark Knight as two examples of all that is wrong. I have seen many articles around the net about the attempts from the Dark Knight marketeers to get a viral campaign up and running, but I have never seen any of these items in the wild. When the only time your viral video gets play is when bloggers are trying to explain what you are trying to do, then your viral videos have failed. Then there is Indiana Jones and the Kingdom of the Crystal Skull, which has to be the most botched hype machine ever. The sheer amount of over promising and under delivering that these guys have down has done the unthinkable: It has cooled my interest in Indiana Jones, leading me to skip most articles I see in my feeds because I am almost certain it will be just another picture of a hat on a box or another cobweb picture. The videos have even been dull. I an tired of getting excited about the newest tidbit they announce only to say, "That's it?" The one bright spot in the malaise of botched viral marketing is Hellboy 2: The Golden Army. When I saw the comics I thought they were alright, the first flick was alright, but nothing that really excited me. 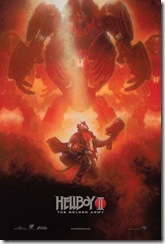 The slow drip drop of information about Hellboy 2 turned my head. At every turn, they have under promised and over performed on each and every item they brought out. My anticipation has grown to the point where I have even started reappraising the first film. What these studios need to learn is that if you promise me the most amazing picture ever and it is nothing but a hat on a box, it will have demoralizing effect on the people that want to be excited about what you are doing. When you put out a new trailer, make sure it has new footage in it. More important than any of that, follow Scotty's rule, always under sale what you have so the word of mouth will rise up to proclaim the glory of content. Oh, yeah, and make the content itself worthy of praise. Older PostLego Indiana Jones Movie?